As my due date approaches, we thought we should finally reveal the nursery. It's not 100% finished yet - I still have to make a pillow for the rocking chair and there's a closet door that's waiting to be finishing and hung, but it's 95% complete and ready for this baby girl whenever she decides to come. 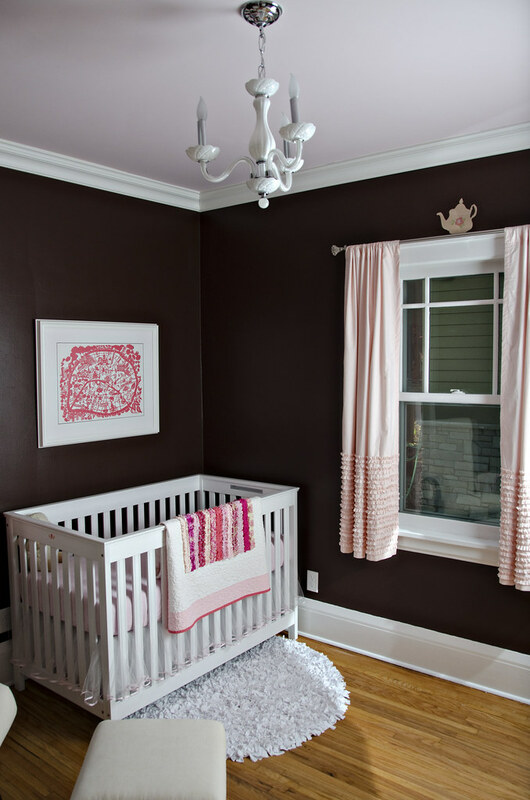 We painted the walls a dark chocolate with a very light pink ceiling and wide white crown molding. My parents bought us the crystal chandelier and I think it fits the room just perfectly - not too prissy, but very classic. 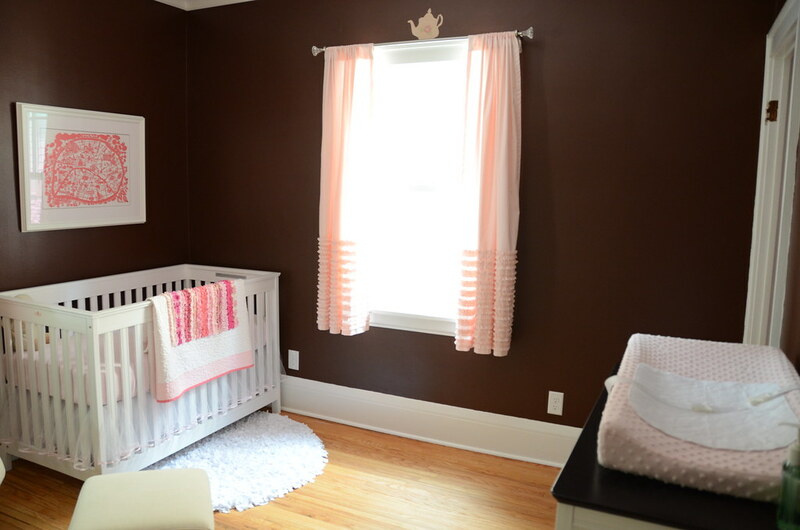 The ruffle curtains are from Land of Nod (great prices at the outlet), and I made the matching ruffle quilt that's hanging on the crib from this tutorial. I also made the tutu bed skirt (over 9 yards of tulle!). The rug is made from pieces of t-shirt material that kind of mimics the ruffle detail (and is machine washable!). The picture you see hanging is a print I found from an artist in the UK called Famille Summerbelle. It's a map of Paris that shows all kinds of fun, quirky Parisian life - it's based on a hand paper cut the artist did. Turn around and you'll find . . .
On the other side of the room we have the changing station and dresser. It's hard to tell from the photo, but the dresser has gorgeous crystal knobs and is quite girly. 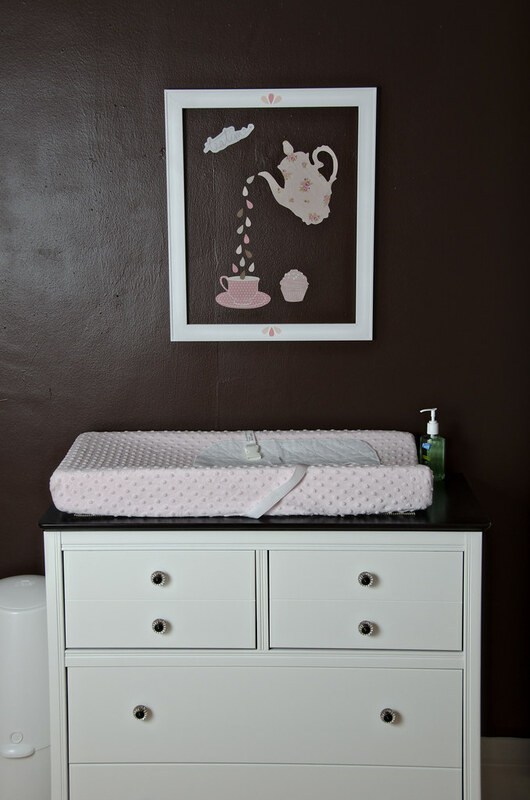 Above the changing pad are Tea Party fabric decals I found from an artist in Australia called Mae Well. The white decal on the left says "teatime" and I love the delicate tea-cups and cups cakes we've sprinkled throughout the room (especially the tea pots on top of each window). Every little girl needs a great closet. Since we live in an old house we relied on The Container Store to design us an awesome Elfa system to really utilize the space. A fun fact - about half the dresses you see on the upper rack were mine from 1980 - can't wait to dress her up in them! There is the last corner of the room - the glider and bookshelf. The glider is so comfortable, I have a feeling we will get our money's worth out of it! The bookshelf we found at the Land of Nod outlet in the Chicago area. My favorite part is the toy bin at the bottom. As you can see we have quite the head start on books and toys already! We again used the fabric decals to add some cupcakes and tea cup interest (I couldn't help myself!). Well - that's it! What we didn't show you was the "before" picture where the ceiling collapsed from water damage and caused a whole domino effect of renovations. Over the last 5 months we replaced the ceiling, upgraded all the electrical, painted the ceiling and walls, refinished the floors, installed crown molding, painted all woodwork, redid the doors and hardware, and redid the closet. We hired out some of the work, but Will and my parents helped immensely as I couldn't climb a ladder or use any chemical-based product (Thanks again!). Hope you enjoyed the tour, now we wait . . .
Hi! 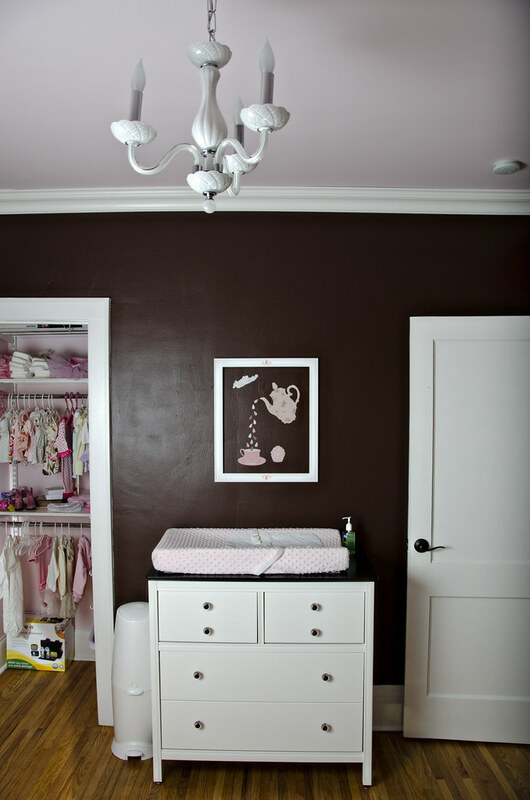 I found your blog from Carlye's...Your nursery is adorable! I love it! The brown walls with the pink is such a great combo. You will definitely get your moneys worth out of that glider. Those first few weeks I felt like I lived in ours, and I still use it at least once every day! Good luck with everything! Little girls are so much fun!